Take to the next step in exploring Hellfrost with this epic series of veteran adventures! A caravan of slain refugees isn't an unusual sight, especially in winter, but why do they have their weapons drawn, yet show no sign of wounds? And who are the mysterious “white men” of which the lone survivor speaks? . Fate has drawn heroes into a race to uncover the secrets of the past, secrets which have been deliberately concealed for centuries. A terrible crime committed long ago brings repercussions for those in the present age, for someone must pay the price for the Sins of the Fathers! For generations, two families have been engaged in a bitter blood feud with distant kin in northern Nordmark over possession of a supposed relic, Stormhammer. Though geographical separation has prevented open bloodshed, a war of words has raged long and hard. By order of the High King a peace deal has finally been brokered. All the heroes have to do is cross the land in winter and deliver the sacred head of Stormhammer to Nordmark. But the threads of fate woven long ago by the Norns are convoluted and nothing is quite as it seems. Danger and mystery abound, especially for those who possess The Blood of Godhammer! Literally hundreds of prophecies were made during the Blizzard War. One such prophecy was in regards to “The Blood Tide.” Written down in fragments by a priest of Neorthe, it told of the sea turning red with blood, a monstrous force which would drive the races from the oceans, and an unstoppable tide surging from the sea to devour those who dwelt on the coast. It told of other events which would signal the beginning of the prophecy, events which at the time made no sense. Now, over five centuries later, the pieces of the puzzle are finally falling into place. All that stands between destruction and victory is a small band of heroes. Triple Ace Games present The Blood Tide. A Hellfrost adventure for the award-winning Savage Worlds RPG. The Dark Night – Buried in secret, Helfreth Helasdohtor a powerful priestess has been slowly breaking the sigils of her ancient tomb. When the sigils fail, the great evil will once again be unleashed onto the unsuspecting world. In preparation for this second coming of darkness, Hela has stirred Helfrith from her dreamless sleep. Can our heroes stop this evil? The Demon of Duncallaich – The demon Kithreth lies trapped and bound to the soil of an ancient lost town of Balyeux, which was destroyed during the Demongate Wars. Its taken many years for Kithreth to loosen his bonds but now he is slowly returning to the world and now a cult has formed to aid his release. Can he succeed in his escape or will he be defeated – only you can find that answer! 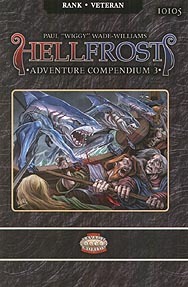 Hellfrost Adventure Compendium 3 is designed to be used with the Hellfrost Player’s Guide, Bestiary & Gazetteer using the award winning Savage Worlds RPG.